The trailer that is used for tractor pulling is of course not a standard trailer but has been designed especially for the Tractor Pulling sport. Eventhough the rear wheels might look like a regular trucktrailer, the font has nothing in common. The front of the trailer is more like a sledge that "slides" over the ground. There are several main parts of the trailer, like the wheels, the sledgefoot, the ballast, (distant)measure point and of course the operator (I might forget/skip some parts). There are of course several of these trailers but their concept is all more or less in common. There are of course also several safety measurements. The idea is quite simple; the ballast, in above picture in its starting position above the rear wheels, can be charged with a certain amount of weight, usually blocks of ciment. The ballast is mounted on a rail and will move forward and start pushing on the sledge as distance is travelled, which makes the trailler build more resistence with the ground. The sledge itself can either be tilted to make it "dig in", or can have large "knifes" underneath which can be used to poke into the ground. The wheels itself can brake too of course, but in relation to the forces at work, they have little influence. 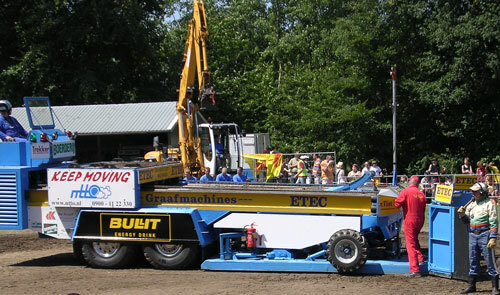 The operator of the trailer, sitting at the back, controls the trailer and can, in case of emergency, stop the engines of the pulling tractor by activating its killswitch. Most of these special trailers are self propelled. They can back up and regain the starting position on their own.